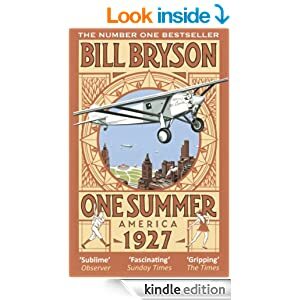 Holiday reading doesn't come better than Bill Bryson's new book which is centred on the year 1927 - I bought the Kindle version for £3.49 which is fantastic value. I have read two of Bryson's books before: "A Short History of Nearly Everything", and "At Home: A short history of private life", and his new book follows the same witty and informative style. 1927 was the year Charles Lindbergh flew solo across the Atlantic and there is a lot of coverage of not just this flight, but many other aviation stories as well. Lindbergh, along with President Calvin Coolidge, Babe Ruth, Henry Ford, and Jack Dempsey made most of the news in 1927. Other events such as the trial of Ruth Snyder (executed in 1928) and the executions of Italian Anarchists Sacco and Vanzetti, plus the continuing Prohibition keep each page of the book as a mine of interesting information. Bryson has a great skill in linking events together and keeping the reader's interest. He has skilfully avoided providing an encyclopaedia of events that occurred in 1927 by linking in the build up to each story (and also providing a follow on of what happened next). Bill Bryson is also a very funny writer and makes a potentially dry subject of events in one year into a super read. This book (especially at £3.49 for the Kindle version) is well worth reading, and I certainly enjoyed it.